Cherry Cupcakes (set of 3) ..
1.75" Chocolate Strawberries (set of 6) ..
Set of 6 lscious dark chocolate strawberries with white chocolate drizzle ..
Set of 6 Large Strawberries (1.75"X1.75") with white chocolate and dark chocolate drizzle. 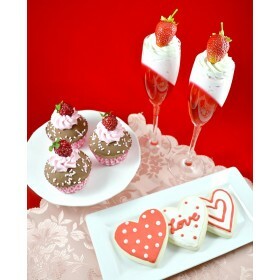 ..
Heart CappuccinoMadelaine cookies sold separately ..
Set of 3 heart macarons creates a Valentine's mood. ..
Raspberry Mousse Cake (9" W X 4" H) ..